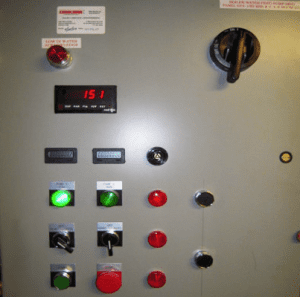 Whether bringing older HVAC, power or security components within your BMS up to date, or requiring a complete building automation system / BAS , Electronic Control Corp can design, build and install the electronic control systems for your Building Management Systems. We offer comprehensive solutions, tailored to your building management system requirements. You know that bringing your BMS up to date will lower your facility costs, provide more operational efficiency and reduce the risk of failure. But where do you find a team of electronic control professionals who have extensive experience on the ins and outs of knowing how to properly rewire, replace and program your Building Management System to ensure success ?ECC-Automation constantly comes across old components that need to be swapped out and electrical wiring replaced or re-routed. We are well-versed with the capability to integrate some old and some new. Read how we upgraded a duplex pump control station and integrated it into the Building Management System. Many modern automated control solutions in manufacturing and extreme precision control processes require facilities that regulate and monitor building management systems elements. If you are a food manufacturer, your process most likely requires maintaining a certain temperature and humidity within the production facility to ensure your food product turns out properly? Other industrial processes such as Plastic extrusion require BMS integration to sensors throughout the line, that ensure precise temperatures are kept constant. With the goal of getting your building automation system running at optimal levels, Electronic Control Corp. offers modern state-of-the art approaches. Give us a call or email us today and let us hear more about your BMS challenges to see if we can help. Does your project require custom electronic control design?